Everything’s bigger at Sophie & Zeke’s since their move to Opera House Square in downtown Claremont – even the music. After a rehabilitation of the historic Brown Block building lasting years, the restaurant now has twice the kitchen space, room enough for double the customers, and an entertainment calendar that will soon extend to three nights. 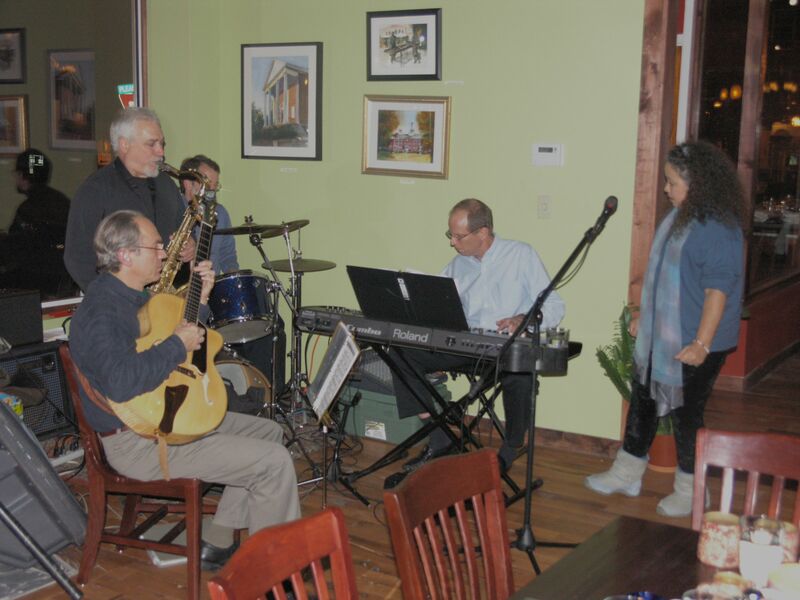 For their first appearance at the new location, the Billy Rosen Quartet became a quintet. Shayma, who joined the group in late fall, sang jazz standards, while Billy and sax player Nick Scalera traded licks. “We want to mix it up and try something different,” Rosen said between sets. Sophie & Zeke’s owners Reid & Danna Hannula have similar intentions – they recently announced plans for an official grand opening on Saturday, December 6. The all-day party features food samples from Walpole Creamery and Claremont’s North Country Smokehouse, a live radio broadcast, and music – lots of music. In addition to wine tasting and an art opening, there are plans for dancing into the late evening hours. That’s a first for the restaurant. Since opening in 2005 at 50 Pleasant Street in Claremont, they’ve stuck mostly to jazz, with an occasional bluegrass band and evergreens like Pete Merrigan and Al Alessi. Clearing away tables and jamming well past dinner is brand new. For the grand opening, Sophie & Zeke’s invites New York-based “The Thang” to get the dancing started. The funky band rocks a sound somewhere between Black Eyed Peas and the Red Hot Chili Peppers. Reid found the group through Abby Payne, an alt-rocker who’s booked to play her own set prior to the Thang’s. It will surely be a memorable double bill, but believe it or not, the twofer is only the latter half of an entire day’s worth of music and activities. A live remote broadcast from Hanover radio station 99 Rock will bridge the gap between afternoon and evening, along with the aforementioned food and wine specialties. With all this non-stop action, there’s barely time to change clothes between shifts. Fortunately, Reid now occupies a freshly renovated apartment on the second floor of the Brown Block (in addition to the family home in Sutton, New Hampshire). “It’s always been a dream of mine to live in my restaurant, to just have it always there,” he says. As he describes the sweeping views of Broad Street Park and Opera House Square from his new corner unit, it’s clear the upstairs/downstairs arrangement is working well so far. Sophie & Zeke’s will continue to present music every Thursday and Friday night at the new location; they’re also working on a first-ever New Year’s Eve bash, with menu specials, champagne and DJ dancing. The restaurant hopes to have firm details of the event in time for the grand opening.